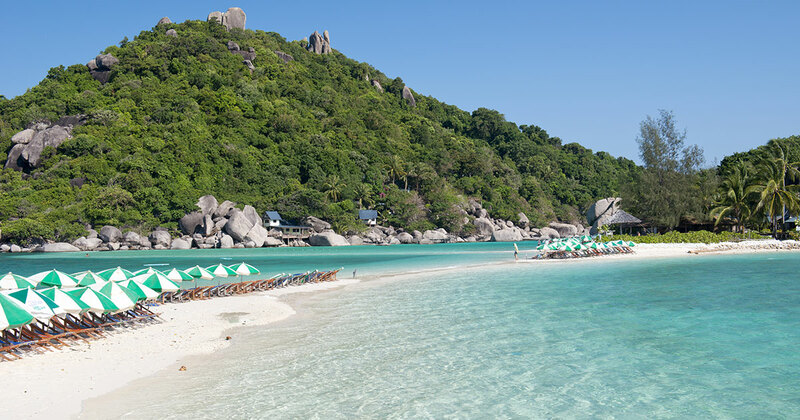 Ko Tao is also known as the turtle island as its shape resembles one. Ko Tao´s little sister island, Ko Nangyuan, is a private island that consists of three smaller islands connected together by a beautiful sandbank. Together, these locations form three bays with crystal-clear water and no current, white sandy beaches, a variety of colorful fish and fascinating coral reefs that offer optimal conditions for snorkeling. Exclusive to our private yacht Charter we offer a slightly altered schedule which arrives at Koh Nangyuan in the morning in order to avoid the large groups of tourists whom arrive in the early afternoon. You will have about 2 hours to explore Nangyuan above and below the water. Climbing to the hills for spectacular views, snorkel the world famous marine locations, all within a 5 minute walk, such as the “Japanese Gardens”, “Twins” and the “Koh Nangyuan Pinnacle”. The snorkeling sites are clearly marked and closed off for all boats, so you can completely engulf yourself in the snorkeling experience without a worry in the world. After lunch we will visit Koh Tao’s snorkeling site at Mango Bay, one of the less known and well preserved snorkeling spots that Ko Tao can offer and then venture back to Koh Samui at approx. 3pm.